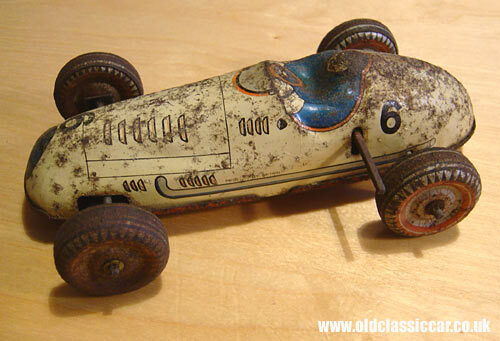 Two British tinplate toy racing cars by Mettoy. 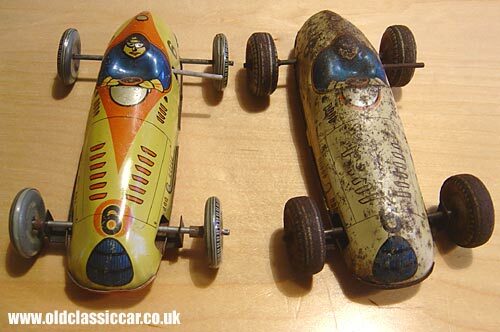 Two examples of the same toy racing car. 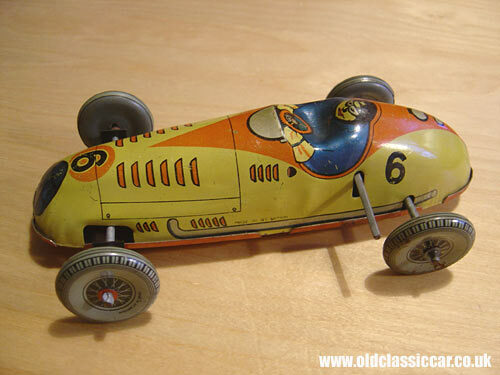 I think these tinplate racing cars were made by Mettoy (a manufacturer already featured on this page), one of the best known British toy manufacturers of the 1940s and 1950s. Although the two toys look virtually identical (bar condition! ), there are a number of subtle differences between the good example, and the rusty example shown here. For example, the rusty toy has much wider wheels on it, very similar to those shown on the red Mettoy in the link above. The lithography also differs slightly, with the good example having an orange livery on the upper surfaces, that doesn't feature on the tatty toy. Both however are marked up as "Made in Gt Britain", and probably don't differ very much in age. Both have clockwork motors that work perfectly. The tattier example weighs a little more than the clean one, so perhaps there are differences between the motors, or perhaps the gauge of metal used. Both racing cars measure approximately 7 inches in length.